I know what you're thinking. You're thinking, "What the hell am I going to read about during this extended holiday weekend?" (Bear in mind, of course, that my mind-reading abilities are limited to the United States.) "Everyone is out running around and spending time with their relatives, so there's not much in the way of news and all the good bloggers are on a multi-day hiatus!" 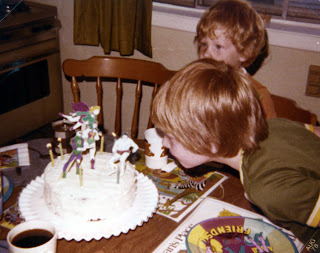 The cake decorations were drawings of several heroes that my father copied from various comics. cut out, and glued to popsicle sticks. Green Lantern, Wonder Woman, Supergirl and Tarzan are immediately recognizable. And in the lower corner, you can clearly see the Super Friends themed birthday plates.